Neighbors are nice, but the true real estate dream of any New Yorker is taking over the place next door. For a director and actor living in Brooklyn's Vinegar Hill neighborhood, the fantasy of connecting their home with the empty adjoining address came true — and was especially sweet given that the pair has three dogs. 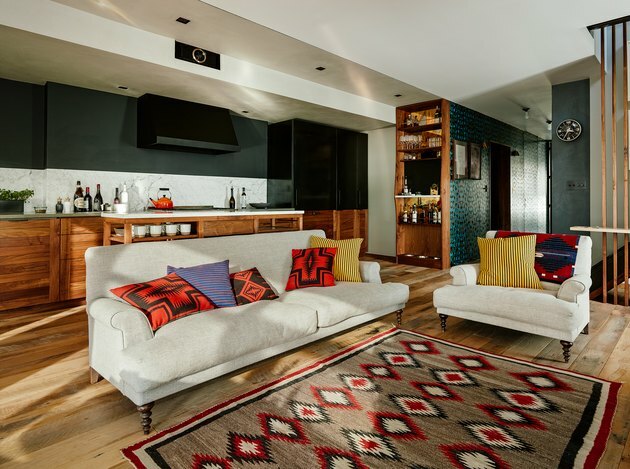 Designer Sarah Zames, founder and principal of the firm General Assembly, came on board to blend the two side-by-side apartments together seamlessly, while also keeping the owners' love of entertaining in mind. 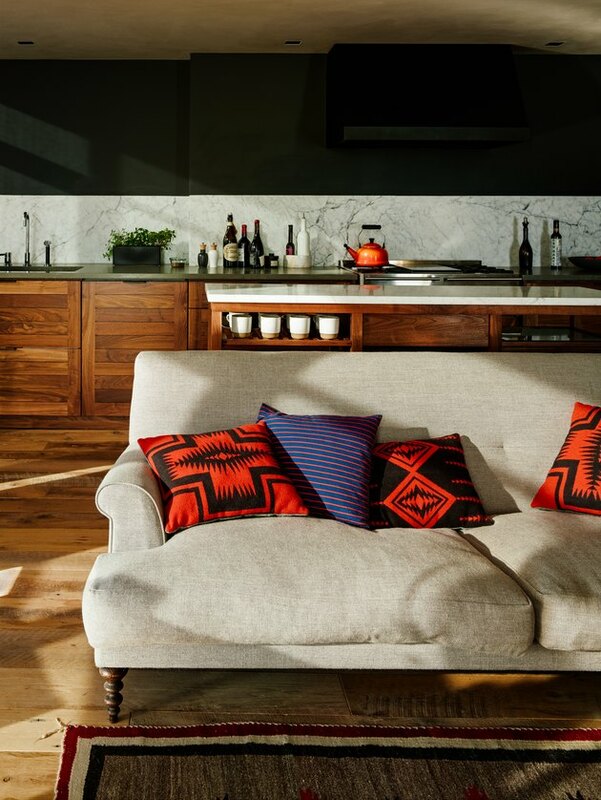 To start, Zames outlined a large chef's kitchen that's open to the living and dining areas, creating a party-ready space suited for dinners or a screening. 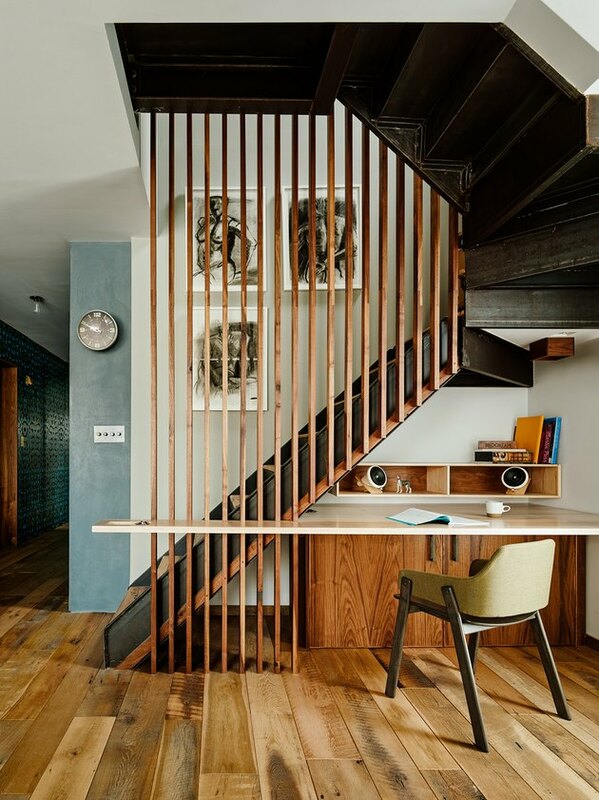 She then stuck to a rich palette of materials like concrete, blackened steel, and walnut to bring in texture, and opted for graphic wallpaper in the entryway and bedroom add personality. "We wanted to use materials that felt like they had some kind of history to them," Zames noted. "It was an important piece of the design that helped make a new building feel more like a comfortable home." The finishing touches were tailored to the three canine residents. "We renovated one of the roof decks to create a special place for the dogs, and also incorporated some dog specific items, like food bowls, into the millwork," she said. The finished property is bold and personal, and it's now roomy enough for anyone who enters, whether they have two legs or four. 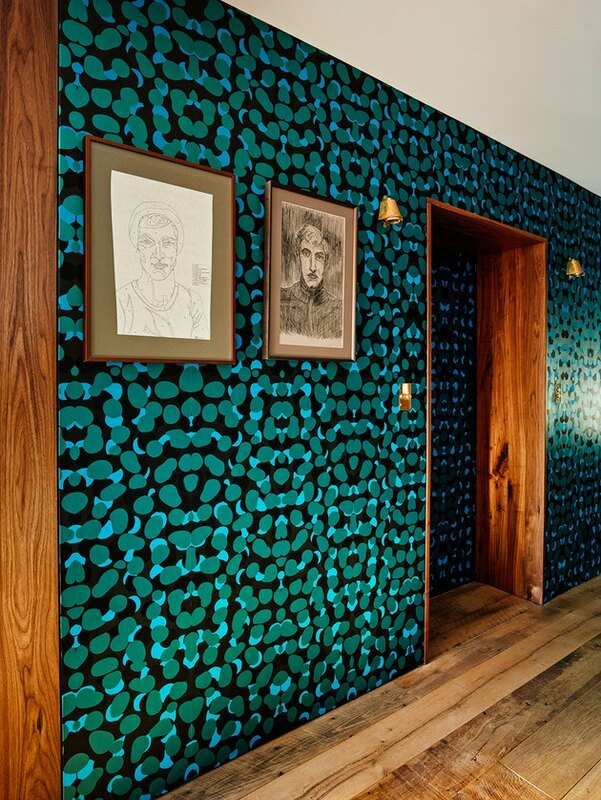 Eye-catching wallpaper by Flavor Paper lines the entry hall, where Zames added a custom walnut surround and Davey Lighting Mast lights by the elevator door. The open kitchen and living area were outfitted with reclaimed oak flooring and a troweled concrete ceiling. "We wanted to bring a lot of texture and natural materials into the space so that it would take on the personality of the homeowners," Zames said. The living room is arranged around a projection screen, which is flooded with light from a wall of windows during the day. "We oriented the plan of the apartment to take advantage of the large windows on each end of the space," Zames said. A lighting fixture by John Beck illuminates a custom walnut-and-steel table and vintage stools in the dining area. Zames installed walnut cabinets, concrete countertops, and a statuary marble backsplash in the open chef's kitchen. The marble-topped island adds additional storage. 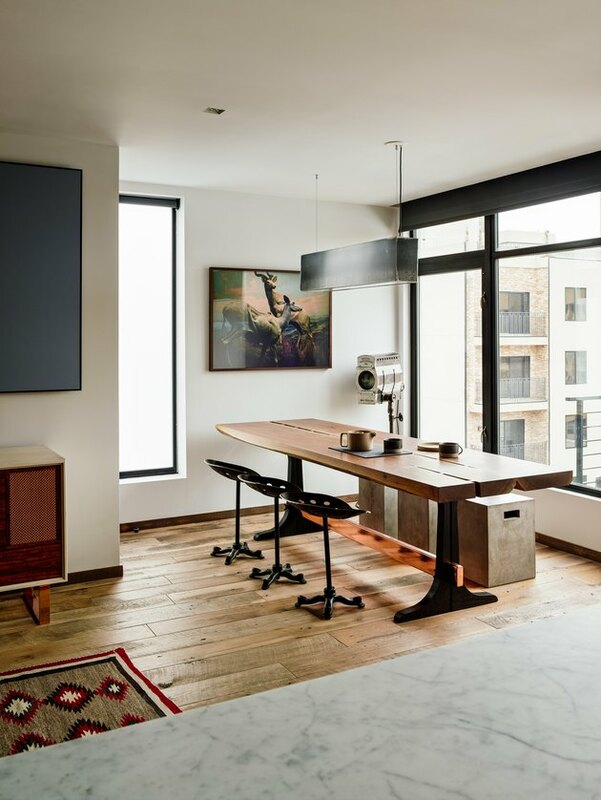 The living area's clever custom desk conceals a small mattress that folds out for guests. 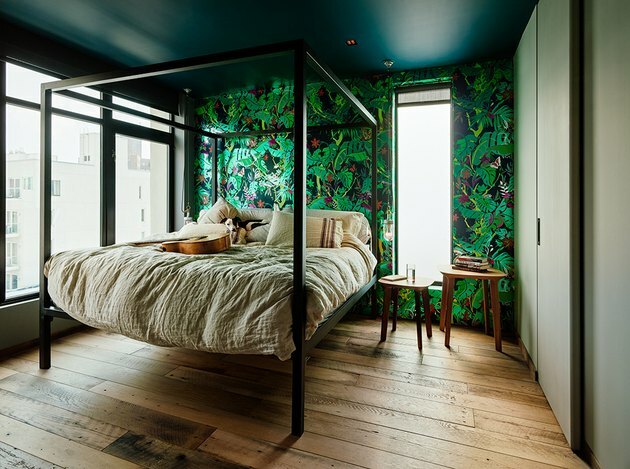 A tropical print by Flavor Paper is paired with Farrow & Ball's "Hague Blue" paint on the ceiling to create a vibrant bedroom. Clean-lined furnishings, such as the Rich Brilliant Willing side tables Room & Board bed, let the pattern and color take center stage. 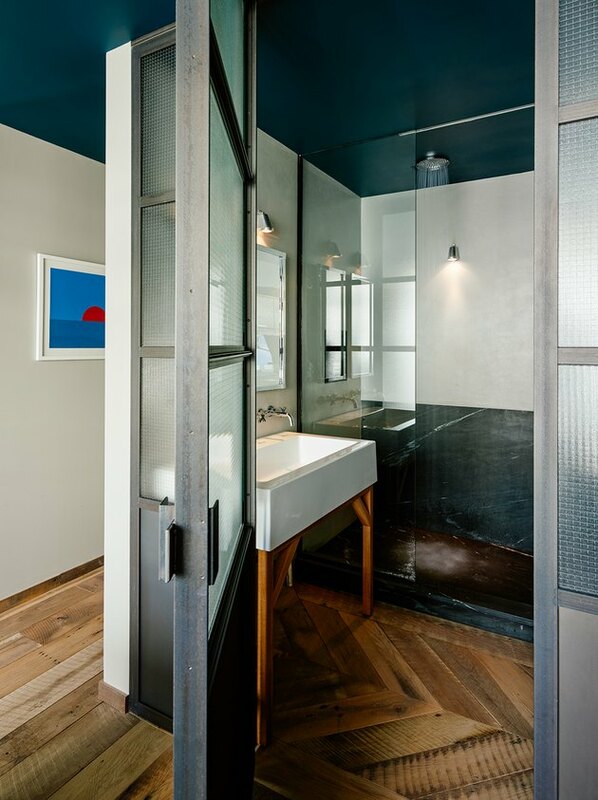 A custom steel door opens onto the master bathroom. Davey Lighting Mast lights brighten the concrete and marble shower. 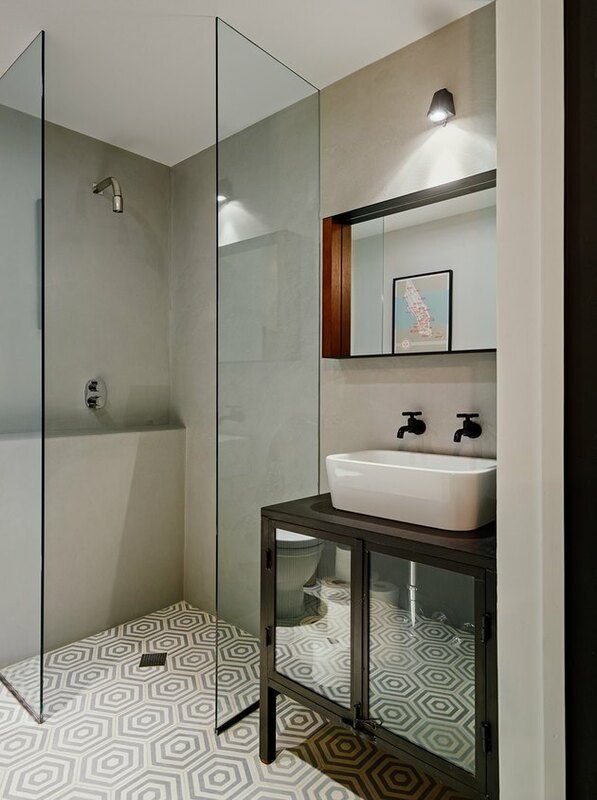 Concrete tiles add a subtle pattern to a guest bath, where a storage cabinet found at ABC Home was converted into a vanity.